Some oddball sets fit a soft spot in my heart, thanks to their context or theme, and this small group of postcards feels just right. They're the product of long-time New Jersey resident Bob Bartosz, profiled as Camden County's official photographer, and still photographing for the fire department more than 50 years after he started in 1959. 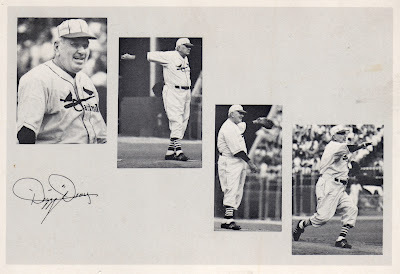 Dizzy Dean's held forth as team ace during the Gashouse Gang's championship run in St. Louis and collected an amazing 102 victories from 1933-36. 150 career wins proved enough to get him into the Hall of Fame in 1953, but he'd have a harder time in 2011. While Kirby Puckett and Dean both played a dozen seasons, the former ran it out everyday and appeared in less than 125 games just once. Guys with short careers can't throw in empty years anymore, like Dizzy's three (!) with just 1 game each (career stats). Bartosz bound 24 of his photos into a postcard book, discretely numbered at lower-left on the back, and likely sold them by mail or in-person locally. Last week, reader Ed Watts helped figure out answers to the Memphis Chicks matchbox trivia. Today's Dizzy Dean montage spurs another question--what year and stadium is Ol' Diz pitching in? I've seen an in-uniform Old Timer's Game photo (shown here) of him at Yankee Stadium in 1962, but that's well before my time. Can anyone confirm or deny that game as the sequence pictured on today's #5? UPDATE: Ed chipped in again to say it's likely the Astrodome, given the arrangement of fencing seen behind Dizzy's wind-up. He even appears uniformed in a blog article called Old Timer Games at the Dome! 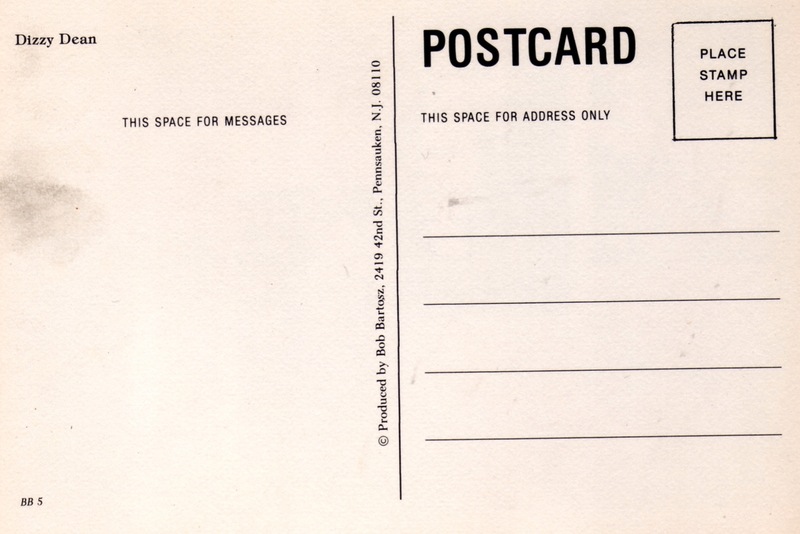 Value: This postcard cost $5 on eBay in 2008. Singles that don't picture HOFers might run less. I've been getting burned out on buying autos and memorabilia cards as of late... your site is awesome, because it gives me other things to chase down off of eBay. 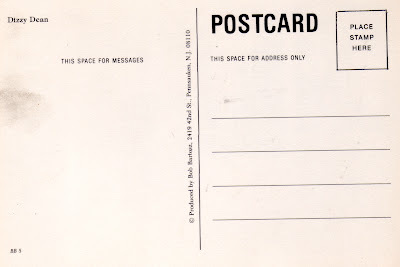 These postcards are really cool... hopefully I can pick one up in the near future. Thanks for sharing all of these cool oddballs!